The main objective of an aseptic process is to maintain product sterility by controlling and containing the risk of microbiological contamination. The use of isolator technology significantly reduces this risk as it encloses within it a specific work area characterised by extremely limited human intervention and defined and controlled environmental conditions, obtained through the use of various systems such as microbial retention filters, automatic sterilisation or decontamination processes and prevention of re-contamination from the external environment. The decontamination of surfaces inside the isolator occurs through the use of a sanitising and sporicidal agent which, in most Pharma guidelines, is recognised in Vapour Phase Hydrogen Peroxide (VPHP). does not need critical pressure levels, so can be used to decontaminate large volumes. The decontamination process with VPHP inside an isolator envisages two main decontamination mechanisms: dry and wet. The difference between the two lies in the concentration of VPHP in the chamber during the injection phase: for the dry cycle, the concentration of H2O2 is kept below the dew point, whereas in the wet cycle, a quantity of vaporised solution is injected to create an oversaturation of the air in the chamber. Figure 1 shows the theoretical pattern of VPHP concentration and relative humidity (UR%) during the various phases of a dry cycle – theoretical pattern of VPHP concentration and RH% throughout the cycle. Let’s take a look at the four phases in detail. The purpose of the dehumidification phase is to reach determined temperature and relative humidity conditions inside the isolator and generator (warm-up phase), before injecting the VPHP in order to achieve a condition in the chamber that maximises the concentration of hydrogen peroxide in a uniform and repeatable way. It is known that factors such as isolator dimensions and temperature and relative humidity can influence the duration of the dehumidification phase. Therefore, at the line design stage, it is important to appropriately size the HVAC that serve the isolator or the system supplying air to the generator (compressed air or the like). During the conditioning phase, the 35% solution of H2O and H2O2 inside the VPHP generator is completely vaporised through the “flash vaporization” process and then injected into the chamber until all areas of the isolator have a uniform concentration level. 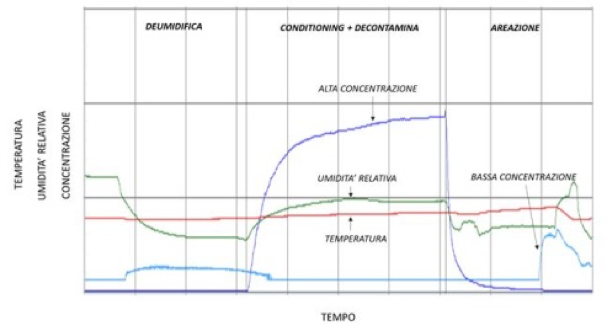 As stated previously, for the wet cycle, this concentration is higher than that corresponding to the dew temperature of the solution, while for the dry cycle it is kept below to prevent the formation of condensation. In both cases, while the vaporised solution, which also contains water, is being injected, the RH% (relative humidity) of the air in the chamber rises. Having reached the desired concentration of VPHP in the chamber at the end of the conditioning phase, this concentration must be maintained for a determined length of time, known as “killing time”, important for reducing the microbial load, which regulations generally set as ≥ 106. The duration of the decontamination phase is verified using certified biological indicators, comprising Geobacillus stearothermophilus ATCC 12980 spores, inoculated on carriers (generally in steel), with known concentration and D-value that, in turn, are enclosed within Tyvek packaging. Chemical indicators are also used to measure VPHP distribution, which change colour following a change in pH due to the presence of hydrogen peroxide in the environment. 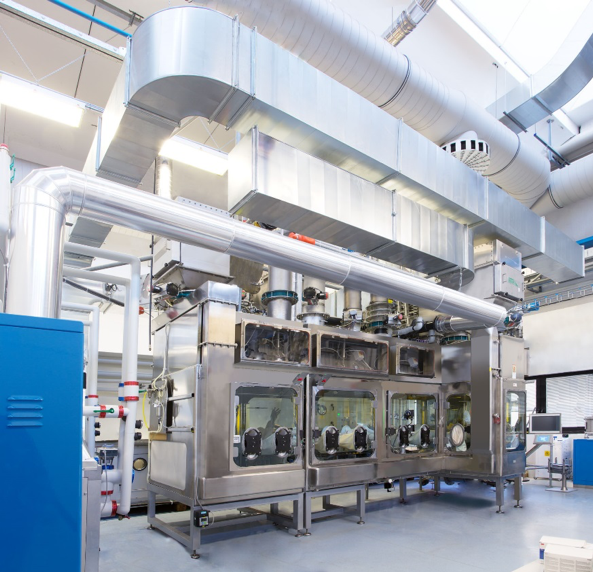 The aeration phase guarantees VPHP removal from the air and surfaces inside the isolator before production resumes and features various stages characterised by specific temperature and relative humidity set-points. A second stage, in which cooler air is injected in order to stop the degassing of materials and, therefore, accelerate the removal of hydrogen peroxide residue to the required safety limit (outlined in the last section). The aeration phase also allows the temperature and relative humidity conditions required for production to be reached. where PH20 is the partial pressure of water in the air and P*H20 (T) is the tension of water vapour at the considered temperature. If a water-hydrogen peroxide solution is present, its equilibrium conditions modify the parameters contained in the definition of relative humidity, in accordance with Raoult’s law. Taking that into account, it is possible to use the relative humidity measurement to define how far an air mass containing the water-hydrogen peroxide solution in vapour phase is from saturation condition. The temperature of the surfaces is generally monitored in the first phases of the cycle. This factor is particularly important in a dry cycle, as it can help identify the most critical positions inside the isolator. In general, these positions correspond to the points at which the temperature is lowest and highest: the lowest temperature can correspond to a point at which local condensation occurs, whereas the highest temperature is where the air is less saturated than other points. As introduced in previous sections, there are two main decontamination mechanisms with VPHP: dry and wet. The difference between them lies in the desired quantity of condensation during the injection into the isolator. homogeneous distribution of hydrogen peroxide inside the isolator. All the above factors depend on the thermo-hygrometric conditions inside and outside the isolator (e.g. temperature of isolator glass or air ducts). It is therefore essential to verify the factors under real and final use conditions. Next issue (Part 2) will focus on decontamination cycle best practices.